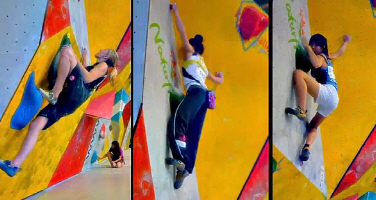 The second Bouldering World Cup of the 2010 season took place last weekend in Vienna, Austria. American Alex Johnson was not able to repeat her victory at Greifensee but she did finish a very respectable 6th place. This weekend the World Cup circuit makes its way to Vail, CO’s Teva Mountain Games for the 3rd time in as many years. With a full slate of American’s set to compete this weekend the U.S. team is looking to continue the success of the past 2 years that saw Alex Johnson win in 2008 and Alex Puccio win in 2009. The U.S. Men have put someone on the podium both years with Paul Robinson taking 3rd in 2008 and Daniel Woods finishing 2nd in 2009, but an outright win still remains the goal. There was a time when I entertained the thought of making the trip out to Vail to see the World Cup for myself but a lack of time and sponsors paying my way money pushed that off until maybe next year. Provided there is a next year of course. The latest issue of Rock & Ice that I’m looking at promises “video updates” from the World Cup starting on Saturday morning at 11:00 AM MST at Rock & Ice’s website as well as via your mobile phone. Whether or not that means a true live stream or just some sort of update clips remains to be seen. Tune in Saturday to find out.